Housing & Job Skills Restore Orphans’ Lives. Many orphanage graduates inherit village homes or flats. But they still end up on the street, or exploited in exchange for housing. Why? Because their homes are often uninhabitable, with exposed wiring, ceilings falling in, no running water, and other safety issues. This October, we’re celebrating our Restoration Project. This program meets two needs at once: safe housing and marketable job skills. A crew of orphanage graduates apprentices with our staff, earning a standard Ukrainian income and developing job skills, all while renovating the dwellings of fellow orphans. Help fund the Restoration Project! 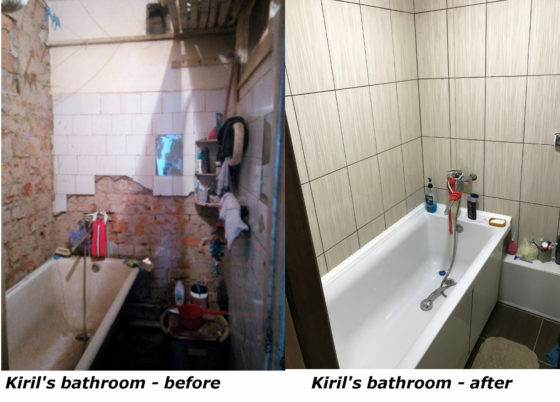 THE PROJECTS: A few years after the orphanage, Kiril had to move in with his alcoholic mother. His sister Vika moved with her daughter into the same dilapidated apartment. After renovating Vika’s room and the kitchen, the siblings ran out of funds. The Restoration Project stepped in to finish the job! Projects are cost-effective, most priced between $3750 and $7500 USD for major repairs. Besides transforming unlivable properties into beautiful homes, recent renovations increased home equity by $6,000 to $11,000 USD. These valuable assets will pass down to the next generation, helping families to stabilize, break the orphanage cycle, and be part of a healthy community. In God’s Kingdom, all things can be made new! Just $5,000 will fund the Restoration Project for three months, or $75 for a day. With winter fast approaching, will you help provide “One Fall Season of Restoration”? PS – Will you help us meet our goal of $5,000 so the Restoration Project can make homes safe before winter? Donate now to help fund housing for orphanage graduates! Donations over the goal go to the general fund, helping us serve orphanage graduates in every aspect of their lives!